It’s a good vacation if you feel like you’ve been away from work for a month, right? Between high school graduation at the beginning of June through the arrival of my new faculty hires this July 1st, I’ve felt like a hamster on a never-ending wheel. I needed this week off! I was looking forward to getting some things done around the house, hanging out at the pool, and enjoying a lazy week of staycation. Mother Nature had other plans for me. I only got one pool day in. My birthday was completely uneventful. While I should have disconnected from work, I did check emails every morning just to make sure everything was ok at work. I didn’t get ANYTHING done around the house like I wanted to. My basement had a little bit of water pooling, but fortunately nothing as bad as other areas of the city. * I went tubing on a river for the very first time. I lost my favorite hat and my sunglasses, but I didn’t drown. If you’re looking for a fun day trip, check out Coal Tubin’. 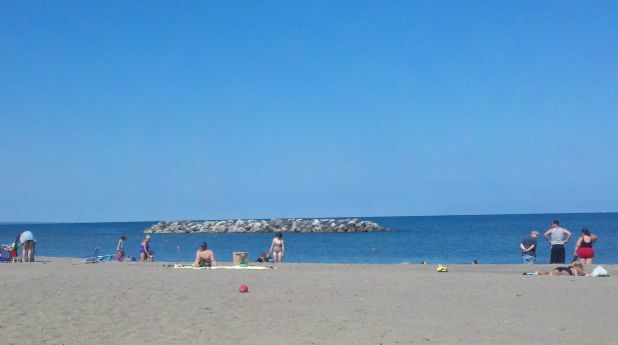 * I spent eight hours with my toes in the sand at Presque Isle. * I did get to hang out with the kids, even with one working this summer and the other sleeping her summer vacation away. * Vampire Boy attended an Orientation Program at Cal U to finish registering for classes. It’s hard to believe that he only has one more month at home before he goes off to school. * I didn’t win the Powerball, so I have to go back to work. * I haven’t met a millionaire who wants to support me, so I have to go back to work. * Tomorrow, I have to go back to work. Six more weeks until vacation at OBX. I’m really looking forward to getting away, really away, for a week at a real beach with some great people and what looks like an awesome house. I’ll need the trip after getting Vampire Boy off to college and Social Diva ready for her final year at middle school. Six more weeks … I can do it, right?! Posted on July 14, 2013, in Family, Kids, Out and About. Bookmark the permalink. Leave a comment.